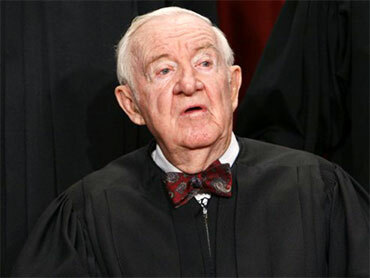 Supreme Court Justice John Paul Stevens was unanimously confirmed by the Senate in 1975 just 19 days after he was nominated. His successor can expect a far more arduous confirmation process. Stevens announced today that he will retire when the court finishes its work for the summer in late June or early July. Republicans have signaled that they are prepared to put up a fight if President Obama's nominee to replace Stevens does not live up to their standards. Mr. Obama's first nominee to the high court, Justice Sonia Sotomayor, was confirmed relatively easily but not without fights over questions of bias that stemmed in part from comments she made about being a "wise Latina." Ultimately, nine Republicans supported Sotomayor. Sen. Jeff Sessions (Ala.), the top Republican on the Senate Judiciary Committee, voted against Sotomayor. In a statement today, he warned the president of the lessons learned from Sotomayor's confirmation. "The product of her confirmation hearing was a near-universal rejection of President Obama's empathy standard, the flawed notion that judges should allow personal feelings, political opinions, and social views to guide judicial decision-making," Sessions said. "The public is deeply concerned about the future of our country, and I expect that the American people will watch these proceedings more closely than ever before. There is much at stake, as the court's interpretation of the Constitution in the coming years could significantly affect the implementation of domestic polices approved by the president and Congress over the past year." Sessions said he hopes he can support the president's nomination but that he will not vote for a nominee who does not "demonstrate a commitment to the Constitution, the rule of law, and the oath of a judge." In his closing remarks from the debate over Sotomayor's nomination last year, Sessions forewarned of more difficult fights to come. Sessions and the rest of the Republicans on the Senate Judiciary Committee this week said they object to President Obama's nominee to the Ninth Circuit Court of Appeals, Goodwin Liu, on the grounds that he may have "attempted to hide his most controversial work." Sen. Orrin Hatch (Utah), another senior Republican on the Judiciary Committee, warned in a statement that "someone who would be an activist judge, who would substitute their own views for what the law requires, is not qualified to serve on the federal bench." On "Fox News Sunday" over the weekend, Sen. Jon Kyl (Ariz.), the No. 2 Republican in the Senate, said the president's nominee could face a filibuster if he or she proves to be an "overly ideological person." "If he doesn't nominate someone who is overly ideological, I don't think -- you may see Republicans voting against the nominee, but I don't think you'll see them engage in a filibuster," he said. Senate Minority Leader Mitch McConnell (Ky.) said in a statement today, "As we await the President's nominee to replace Justice Stevens at the end of his term, Americans can expect Senate Republicans to make a sustained and vigorous case for judicial restraint and the fundamental importance of an even-handed reading of the law." Other Republican senators have weighed in with similar warnings. "Moving forward, I encourage President Obama to nominate a replacement who will be faithful to the United States Constitution, and not a political ideology," Sen. Sam Brownback (Kan.) said in a statement. Jan Crawford: Does Obama Want a Supreme Court Fight?